Mythomania, a student dance production choreographed by Joni Barnard. 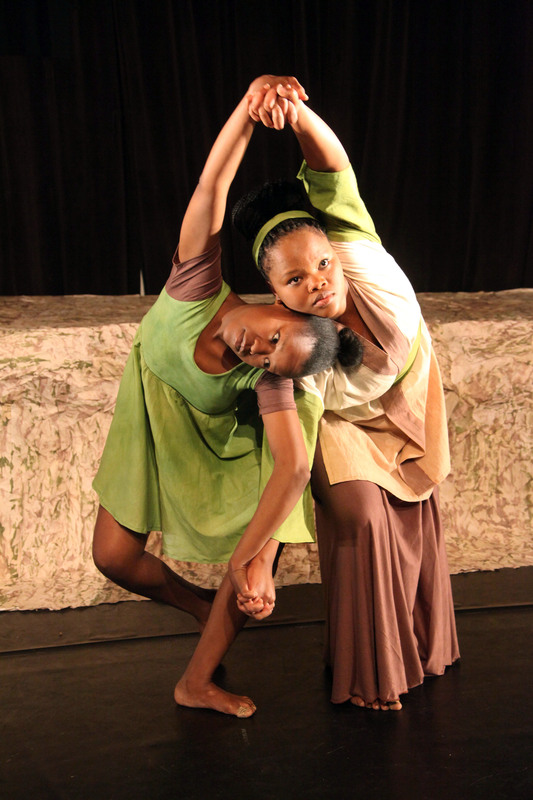 Something beautiful this way comes: Nomathamsanqa Mhlakaza and Boitumelo Magolekgo in OCA, choreographed by Oupa Sibeko. Photograph by Ruphin Coudyzer. When you enter the auditorium and take your seat, there is such a fantastic promise of magic in this seven-piece production, your senses are tweaked and attuned to seeing wonderful incarnate. There’s a squadron of origami creatures of all shapes and sizes floating in the air, and a sphere filled with feathers. There’s a bit of a dodgy ramp made of what looks like papier mâché, but the magic of the origami birds make you forgive that. But there’s also music, so pervasive and jarringly loud and tonally repetitive, you feel your nose might start bleeding. The Downstairs Theatre is a relatively small space. It conveys an intimacy that could be worked with, particularly in a production that plays on your inner chords with magical stories and old myths, but someone made a decision to turn the volume up. And it’s a bad one: the sound is so pervasive it almost prevents you from seeing the dancers. But see them, you must: while most of these performers are obviously not trained in the discipline of dance – they move their limbs without drawing the movement into their diaphragms and souls – there’s a sense of dignified beauty in several pieces, which should push further. The descriptions of the myths represented here that you find in the programme notes are delightful, but in several pieces, the relationship between work and words doesn’t resonate. The highlight is a duo between Persephone and Hades. Called Seeds of Life, Seeds of Death, it’s choreographed by Amy de Wet and performed by Shannon Tootla and Jonathan Young. Without knowing the intricacies of the myth or the manner in which this myth is reworked, this is a scene of love, life and anger, featuring a pomegranate. Touching and resounding with a reflection on the Adam and Eve tale, it’s a power relationship articulated around two interesting performers with great possibility. The give and take between them is shiny in its directness and compellingly authentic in its sense of honesty. In OCA, which is choreographed by Oupa Sibeko and performed by Nomathamsanqa Mhlakaza and Boitumelo Magolekgo, an immensely powerful relationship is articulated. The work speaks of a woman and her sister who seems disabled. And it’s beautiful. But its correlation with a mother and child and a child impaired with the stigma of albinism, as the programme explains, is not developed with sufficient conviction. The pieces in this project involving several dancers, including Kaangs Creation and the Rock of Sisyphus have moments of idiosyncrasy and interest, but the individual dancers seem too inexperienced to carry their cameo roles with a sense of authority that should catch your eye. In the former, in particular, the dancer who takes the role of the Mantis God comes across as a doleful beetle with a baleful gaze in an uncomfortable costume, which just saddens the piece. Costumes also have a spark of something, but in some of the works, like Obanje Abiku, which derives from West African values, the colour coordination of the dresses actually cheapens the work’s impact – as do features like great big green bows at the back of the Mothers’ costumes in the Sisyphus work. Mythomania has some utterly beautiful moments, and completely well developed transitions between pieces, but there are not enough of these moments. The work in entirety is curious and interesting and has fantastic potential, but the scariness of magic in a production is not sufficiently probed or prodded, either through the dancers’ techniques or through ostensible gimmicks in the tale. Mythomania, a Wits University production, features choreography by Joni Barnard, Kyle de Boer, Amy de Wet, Luke Draper, Alicia Hofmeyr, Gaosi Raditholo, and Oupa Sibeko; performances by Justine Barger, Joni Barnard, Grace Barnes, Meagan Connolly, Samantha de Jager, Marion de Pontes, Skye Gibson, Anna Star Hlali, Ben Kgosimore, Rachel Makatile, Nthabiseng Malaka, Boitumelo Magolekgo, Francesca Matthys, Nonkululeko Mduli, Nomathamsanqa Mhlakaza, Candice Modiselle, Abigail Molemo, Palesa Mannakgotla, Dimakatso Motholo,Simphiwe Ndhlebe, Danielle Oosthuizen, Kendal Petersen, Oupa Sibeko, Kim Taylor, Shannon Tootla, Andrea van der Kuil, Lauren Vankeirsblick, and Jonathan Young; and design by Catherine Dickinson and Kamini Soobben (set); Catherine Dickinson, Claudia Hansen and Kamini Soobben (costumes); and Abigail Thatcher (lighting). It performs at Wits Downstairs Theatre until August 16.